I had a really busy weekend and ran out of steam last night so I didn't get a new project finished to share with you today but I am posting a card I did quite some time ago and I'm pretty sure most of you haven't seen it yet. On my card I used the E.A.D. Designs Pocket Full of Sunshine Sentiments set. I used a Caffinated Cropper Kit and Whimsy Haven digital stamps. Also, don't forget to leave a comment on each stop on today's hop! 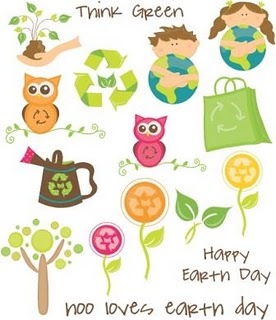 One lucky winner will win these adorable Hoo Loves Earth Day Stickerz!!! super adorable Stephanie!!! Love it! so so sweet! I love the layout too! Super cute! You know I love rainbows! This is perfect! Love, love, love your background to the rainbow. Looks old-fashioned and still timely. This is beautiful! 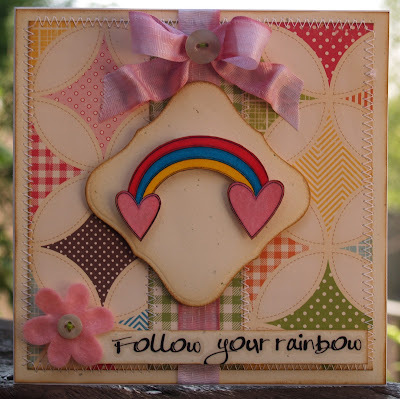 I love the rainbow and the beautiful papers you chose! I love the stitching and the pattern paper. Such a cute card Steph!! Love the rainbow! love the stitching on your projects!! Very cute Steph! I like how you did the ribbon, and the stitching.